My honey Magnolia: Card in a box..B.day+ Advent calendar! Oggi è il mio compleanno, sono 25! Come l'anno scorso c'è un'altro evento importante..
e per festeggiare insieme cosa c'è di meglio che ricevere un bel regalo?? Oggi è il quarto giorno del Calendario dell'avvento se ancora non sapete cos'è ecco qui..
Ed ecco quello che ho creato io per la bellissima occasione! della collezione Waiting for Christmas e North Pole Little Whity. Il sentiment e le carte sono della Magnolia. Ho usato le Doohickey Slender firs,Wooden sign, Christmas tag, tilda mini doily,lovely fence, le altre dal DooHickey Club Magazine Vol.2, . Ho aggiunto qualche perla et voila. Happy birthday to meeee !! Like last year there's another important event ..
and to celebrate what's better than receiving a nice gift ?? 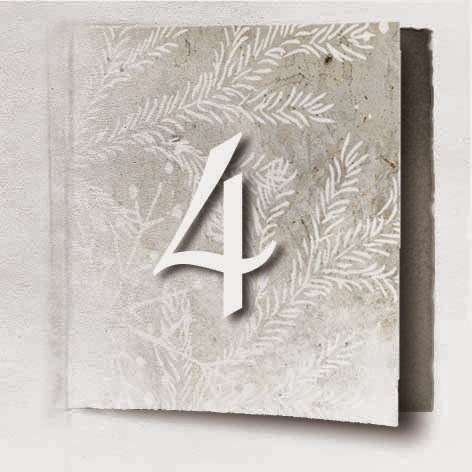 Today is the fourth day of the Advent Calendar if you still do not know what is this that's all ..
every day (until December 31), a member of the Magnolia DT will publish a work Christmas on your blog and leaving a simple comment on that blog will have the opportunity to win a secret prize from Magnolia. Waiting for Christmas collection and North Pole Little Whity. The sentiment and the papers are Magnolia. I used tht Doohickey Slender firs, Wooden sign, Christmas tags, tilda mini doily, lovely fence, the other from the doohickey Club Magazine Vol.2,. I added some pearl et voila. You coloured the image perfectly and can't wait the project you made with it. Whaouuuuu, Joyeux Anniversaire Giada. Quelle belle colorisation de Tilda, J'adore!!! Bonne chance pour ton projet. Je croise les doigts. First a very Happy Birthday to you. I hope you´lll be spoiled all day by everyone around you. Next I went to see your card, and it´s so gorgeous and beautiful as always hun. Happy Birthday dear! I wish you all the happines in the world. Tilda looks pretty. I'll be back later to see you project. So beautiful, and happy birthday!!! 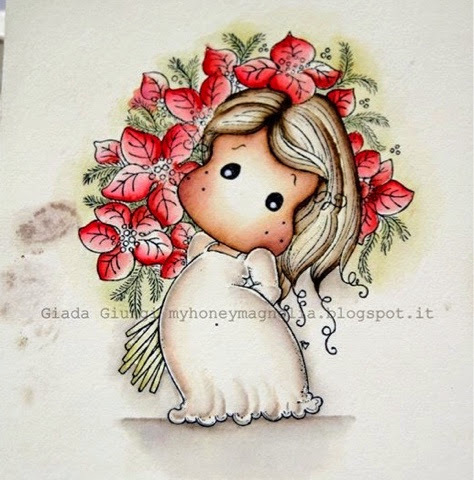 Tanti auguri giada! Molto carino il timbro. Mi piacciono molto anche l'abbinamento di colori che hai usato. Cute Tilda and so is card. At first Happy Birthday to you! And then Tilda, she looks great and I can't wait to see your finished project. He he he!!!.... Immaginavo ci fossi tu al quarto giorno del blog hop!!!... Quale giorno migliore se non quello del tuo Compleanno?!?.... Tantissimi Auguri anche qui!!! Attendo trepidante di vedere il tuo ennesimo capolavoro! tanti tantissimissimi auguri di Buon Compleanno!!! come ho detto ieri ad Alberto, non vedo l'ora che arrivi marzo...io il mio compleanno lo festeggerò al meeting nazionale proprio con voi!!! che gioia!!! Happy birthday to you!!!! And this Tilda is one of my favorites!! Wonderful coloring! Happy Birthday! Enjoy your day! I'll be back to see your wonderful project! Happy B-day to you, hope you have a great day. Your coloring is just beautiful. Your colouring is superb Giada. I will pop back soon to have a nosey at your card in a box. Tilda looks stunning, love it! Happy 25th birthday and i love your coloured image, can't wait to see the finished project. Happy birthday to you! Enjoy this great day. The image is very, very beautiful. HAPPY BIRTHDAY TO YOU!! hope you have a great day. I love your coloured image, Beautiful!! Happy Birthday!!!! A lot of joy, peace and health!!!! Your card is amazing!! Buon compleanno...e non potevi scegliere tilda migliore per questo progetto. Bellissima! Your coloring of these lovely image is fantastic. Hope to see your card in a box soon. Thanks for the chance of winning today a advent-calendar-surprise !!! Bellissima come sempre!!! E tantissimi auguri!!! Buon compleanno! Tanti auguri! Timbro bellissimo e colorato divinamente! Barbara F.
Very nice colouring on Tilda. And Happy Birthday to You! Tanti auguri!! !card stupenda...che te lo dico a fare?mitica! Happy Birthday Giada! Have a wonderful time in Florence! Your coloring is so beautiful! I look forward to seeing your project! Gorgeous image Giada! Can't wait to see the card. Happy birthday BTW. auguri ancora tesoro....e non vedo l'ora di vedere la tua card in a box....ho l'acquolina in bocca! Your colouring is stunning! And I looking forward to see the card ;-) Hugs Lotte! Lov all your cards and your awesome colouring. absolutely gorgeous colouring and happy birthday to you! Just came back to see your card in a box and it is fabulous! This is my second comment! Just had to come back to see your box cad...glad I didM it is gorgeous! Beautiful job! Merry Christmas!